Come mid to late afternoon, we all feel like something to snack on, don't we? Something crunchy, salty, crisp, that we can mindlessly transfer from a packet to a waiting mouth. Usually it's a packet of chips, isn't it. Come on. Own up. I'm guilty of this one, and a dozen other mid afternoon slump evils. Sometimes it's cheese and crackers, sometimes it's corn chips and salsa, sometimes it's just a packet of chips to eat mindlessly. Not good for you, and really, if we're honest, not that tasty. Just crunchy and salty, right? Here's my alternative. It's crunchy, it's salty, and tangy, it comes in a packet and it can be eaten mindlessly whilst trawling your preferred social media site or favourite blogs. Best of all, it's healthy. And inexpensive. One packet of chips (crisps) costs around 80c from the supermarket and up to $3 from a vending machine. Each of these snack bags, costs 70c-$1.20 depending upon how much protein you include, and what vegetables are used. If you use what is in season and therefore less expensive, you'll hover around the $1 mark. I make a dozen of these at a time so that the whole family can have healthy snacks for a few days. Preheat the oven to 180C fan forced. Add the oil to a large baking dish. Remove the tenderloin from the chicken breast (that little bit that hangs off one side), then cut the larger section in half lengthwise, and in half again, so that you now have a tenderloin, and two flatter fillets, cut into four smaller strips. Thus you'll have six chicken pieces from each breast. Place them in the baking dish and coat them in the oil. Sprinkle with your chosen herbs and spices. Zest the lemons and sprinkle the zest over the chicken breasts. No salt, as the lemon is going to provide the healthy zing for this snack. Bake the tenderloins for 25-35 minutes. You don't want them to dry out, so check often after 20 minutes. Cut into them if you aren't sure. They should be just white through the middle and plump and moist. They will NOT be browned. Just cooked through. While they're cooking, trim your veges. Top and tail the beans or snow peas, or peel and julienne other selections. Stick with water dense veges like zucchini, beans, snow peas, broccoli, carrots, or even low carb like cauliflower florets. Bring a pan of water to the boil and dunk the veges in, leaving them for no longer than about 2 minutes to maintain the crunch. This is important as it tricks your brain into thinking 'chips' when you're eating 'veg'. Drain the vegetables well, and dunk them immediately into cold water to halt the cooking process. Spread them all on paper towels on the bench and pat them dry. Cut each lemon into four wedges. 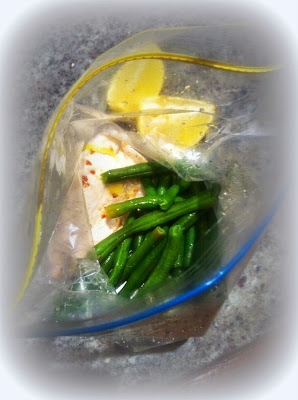 To each ziplock bag, add a generous handful of blanched vegetables, a lemon wedge, and a piece of chicken. Seal and refrigerate. Consume as necessary, squeezing lemon juice over first, and ignoring all calls for other crispy, salty, tangy and generally delicious but completely unhealthy, snacky type thingos. Watch weight melt away, and mid afternoon slumps disappear like magic. They are really healthy snacks, Mimi. Now that I have given up sugar I am getting used to not just grabbing a muesli bar or a slice of cake. I have more of a sweet tooth than a savoury one so chips aren't normally a temptation. I've 'prepared ahead' snacks of all varieties but never thought of something like this ... hmm ... you've given me something to think about. Thanks for sharing! This is such a great idea. Yes, I am terribly guilty of grabbing for the chips. Thanks! Pattie, it's the curse of a good cook to have to watch the waistline. I know you fall into that category! My pleasure Chrissy. Thankyou for stopping by and taking the time to make a sweet comment. Thanks Debbie, and happy to see you here. I hope you'll stop by again. Hello, This is just such a great idea! And yes, I have eaten a few handfuls of chips as I felt so hungry to wait to eat. I enjoyed my visit here today!